Choose from 40 flavors of hand dipped ice cream or our old fashioned soft serve custard. Specialty Sundaes all include three large scoops of old-fashioned hand dipped ice cream. Take a moment to look through our menu and see what sounds tasty! One whole ripe banana engulfed by mounds of chocolate, vanilla and strawberry ice cream. Smothered in chocolate syrup, crushed pineapple and sweet strawberries. Topped with crushed nuts, real whipped cream and a cherry. Served on our own special Milkhouse pig plate. Delicious vanilla ice cream topped with hot caramel, sprinkled with pecans, covered with hot fudge, real whipped cream and topped with a cherry. Salty Spanish peanuts and velvety hot fudge layered on vanilla ice cream. Topped with real whipped cream, more Spanish peanuts and a cherry. Velvety hot fudge smothered over vanilla ice cream topped with sliced banana covered with whipped cream, Spanish peanuts, and a cherry. Chocolate brownie with generous amounts of vanilla ice cream, draped in hot fudge, topped with real whipped cream, crushed nuts and a cherry. Butter pecan ice cream topped with hot caramel sauce, pecans with whipped cream and a cherry. Your choice of 8 scoops of ice cream and 8 toppings. Surrounded by two bananas, chocolate brownies, real whipped cream, crushed nuts/candy and 8 cherries. Finish this and we’ll make you facebook famous! Available with any flavor of ice cream. Your choice of 2 scoops of ice cream, a single topping, whipped cream, crushed nuts and a cherry on top. Soft serve frozen custard, a single topping, whipped cream, crushed nuts and a cherry on top. Homemade waffle cone shells filled with delicious ice cream sundaes for $5! Only available on Tuesdays. 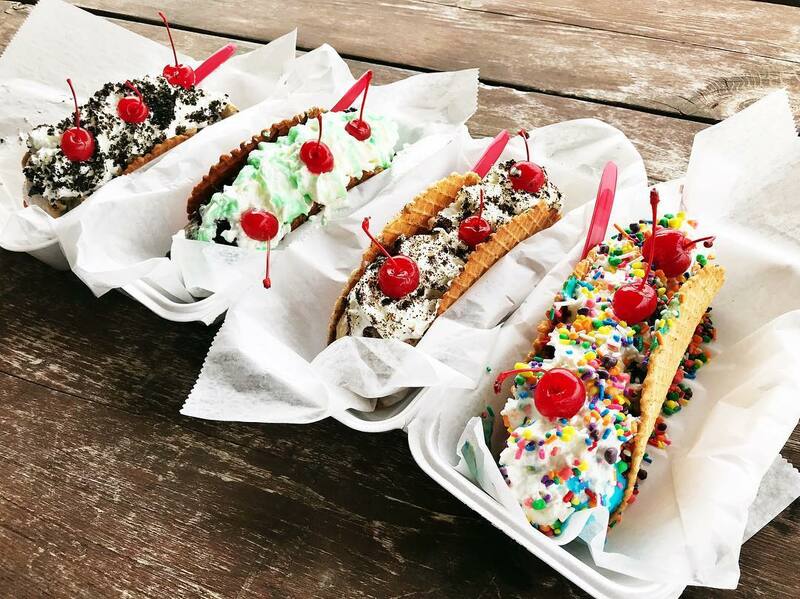 Try one of our delicious taco creations or create your own! Cookie Jar ice cream, layered with Oreo crumbles, cookie dough, and chocolate sauce. Topped with real whipped cream, more Oreo, and cherries. Michigan Pot Hole ice cream, layered with Oreo crumbles, chocolate, and gummy worms. Topped with real whipped cream, Oreo, and gummy worms. Mint Chocolate Chip ice cream, layered with brownies and chocolate. Topped with real whipped cream and cherries. Old Fashioned soft serve vanilla frozen custard, layered with crushed Reese’s Peanut Butter Cups, chocolate sauce, and peanut butter. Topped with real whipped cream, more Reese’s Peanut Butter Cups, and cherries. French Vanilla ice cream, layered with salty Spanish peanuts, and velvety hot fudge. Topped with real whipped cream, more Spanish peanuts, and cherries. Superman ice cream, layered with rainbow sprinkles and Nerds candy. Topped with real whipped cream, more sprinkles, nerds, and cherries. Chocolate ice cream, layered with Oreo crumbles, brownies, and chocolate sauce. Topped with real whipped cream, crushed nuts, and cherries. Butter Pecan ice cream layered with caramel, pecans, and fudge. Topped with real whipped cream, more pecans, and cherries. French Vanilla ice cream, layered with raspberry, strawberry, and sliced bananas. Topped with real whipped cream, crushed nuts, and cherries. Your choice of hard dipped ice cream or soft serve frozen custard, three toppings, whipped cream, nuts, and three cherries on top.